One bright, sunny day, Heather Simpson, age 6, was sitting in her room in Roseville, California, looking at the pictures in her Bible around lunchtime. Heather began to imagine what it must have been like near the Sea of Galilee and pictured herself there. In fact, she could even sense a cool breeze blowing across the water, feel the soft, green grass swaying around her, and smell the sweetness of the beautiful flowers growing along the mountainside. After running so hard for such a long distance, Heather was very tired. Sacha and Emma suggested to her that they should sit down and rest for a little while in the plush, soft grass. Sacha and Emma agreed that having a picnic in such a beautiful place would be a wonderful idea. Before they began eating, some people from the crowd approached them, noticing the food that Heather had just spread our on a cloth. The man, who was one of Jesus' disciples, replied that he would take it to Jesus. Now Heather was very curious to see how many people would be able to eat from such a small amount of food. She recalled Sacha and Emma telling her about the many miracles Jesus had performed and thought something very exciting was about to happen. 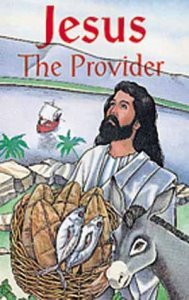 When all of the people were seated in groups of fifties and hundreds, Jesus took the five loaves of bread and two fish from the disciple. He looked up to heaven, blessed the food and gave thanks for it. He then gave the food to the disciples, who in turn passed the food to Heather and all the other people. All five thousand men, women and children ate and ate until they could hold no more. When everyone had feasted, Jesus commanded the disciples to collect any food that had not been eaten. Heather began to count. “Wow! There are still twelve baskets full of food. I was right; something very exciting did happen!” explained Heather. About this time Heather heard a growling, rumbling noise. She realized that it was her stomach reminding her how hungry she really was.